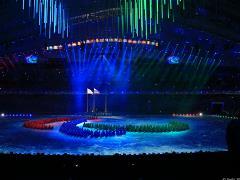 The Sochi 2014 Closing Ceremony, "Reaching the Impossible", which began at exactly 20:14 Moscow time at the Fisht Stadium, concluded Russia’s first ever Paralympic Winter Games. The first Paralympic Winter Games in Russian history has come to a close and concluded an extensive series of Olympic and Paralympic events held by the Sochi 2014 Organizing Committee over the past seven years. Competitions have concluded in men’s free standing skiing at Laura. On the ninth and final day of competition at the Sochi 2014 Paralympic Winter Games, new champions in cross-country skiing and giant slalom will be crowned. The United States defeated Russia in the final of the ice sledge hockey tournament 1-0 and became a three-time Paralympic Games champion.